Chrystal Copland: " The crazier the better I say! More is more!" PR: There isn't much out there about you except that you had pink hair as a child and that you opened Louis Vuitton! You didn't pop out of nowhere - how long have you been working? CHRYSTAL COPLAND: I had been modeling a bit here and there back home in Australia but didn't really get started properly until my first show season. It was all very overwhelming and exciting for me. The Australian market is quite commercial so things didn't really start happening for me until I went to New York. PR: What was your impression of Kate Moss? 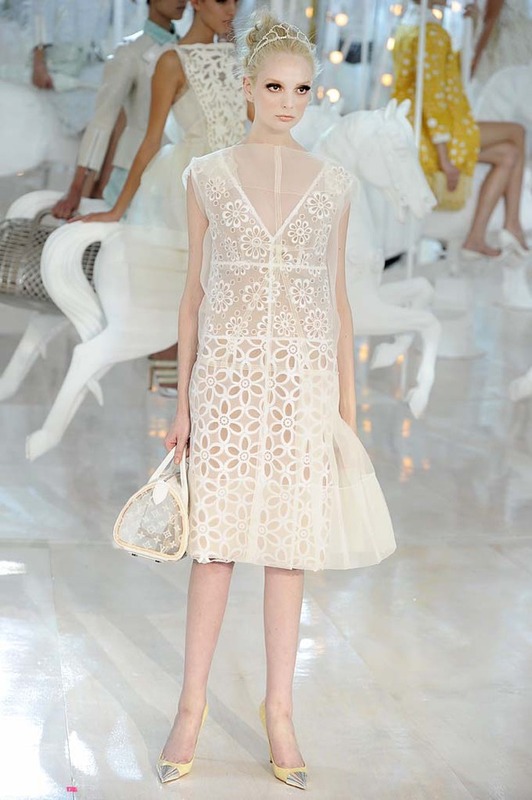 You did a LV show with her. CHRYSTAL COPLAND: I think Kate Moss is the ultimate. She may as well be the poster girl for the fashion industry. I really admire her, it would take a lot of drive and hard work to be where she is. I love her style, she is beautiful. PR: How long have you been with Fusion (http://bit.ly/KfSMg7)? CHRYSTAL COPLAND: A year and a half. PR: How did your development as a model look liked? CHRYSTAL COPLAND: I was always really tall and in the back row in class photo's. I have some pretty tragic looking school photos. 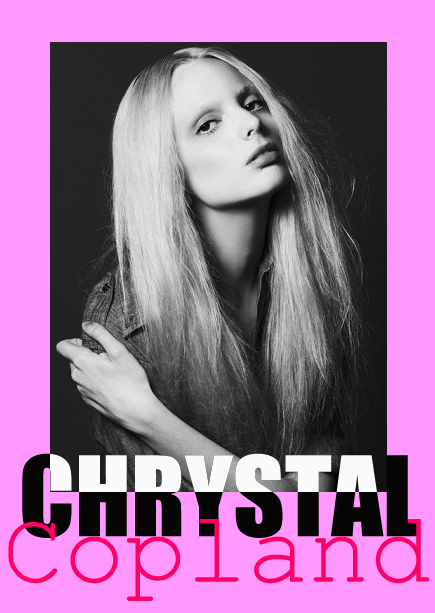 CHRYSTAL COPLAND: I never thought I would become a model haha. PR: You are one of the newest Vogue Italia cover girls! How was working with that particular group of models? CHRYSTAL COPLAND: Everyone was really nice, my best friend was also shooting that day - Dempsey, she is from Perth also; having her there made the shoot a great deal of laughs! We have been friends for years. PR: Tell us more about your style. CHRYSTAL COPLAND: I would describe my style as somewhat crazy and eccentric. I wear whatever I feel like wearing and love sparkles and bright colors. Japanese culture had definitely influenced my style, I have spent a lot of time in Tokyo and am inspired by the fashion in Harajuku. The crazier the better I say! More is more! hahahah. PR: The things you are wearing in Vogue Italia, does it connect to you in any way? CHRYSTAL COPLAND: I absolutely love my outfits in Vogue Italia, I love the gold top with the sequins! That is definitely something I would wear. PR: What did you wear on casting for Vogue Italia? What did the casting look like? CHRYSTAL COPLAND: I wore a top from Zara with a collar and cute little horses on it, and a corduroy high - waisted skirt and heels. When I go to castings I tend to dress down a little more. It is important to be more of a blank canvas I think. PR: Have you done any special polaroids for that, before you met with the Vogue team? 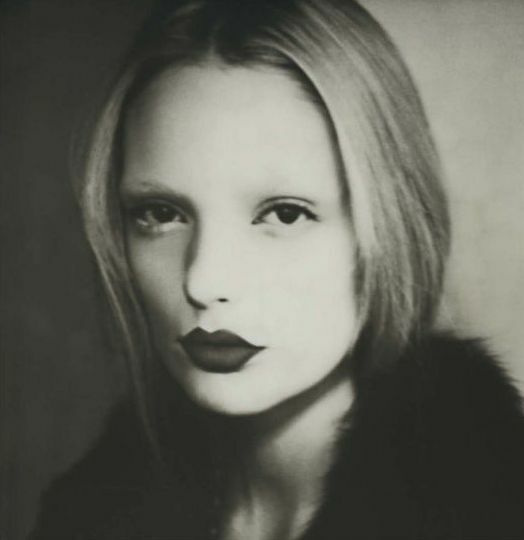 CHRYSTAL COPLAND: I am not sure, I think my agency sent them the polaroids I had already. CHRYSTAL COPLAND: It took place at a stunning hotel in New York. The room was perfect for the masquerade theme. It looked as though it was from another era. PR: When you shot the photo that ended up on the cover.... did you know you were shooting the cover...? CHRYSTAL COPLAND: I was first booked for one day, which then turned into two and then the cover! Steven and his team picked the models they wished to use for the cover on the second day of shooting. It felt very surreal. PR: Tell us something, most of the models dress monochrome and androgynous for polaroids, you on the other hand, you wear blouses, dresses, silk, lace, etc... how so? CHRYSTAL COPLAND: I tend to wear what I like. I think it is important to not lose your individuality in this business and become another all black wearing model clone. I love colorful clothes, all black really bores me. I love to put together a mix of colors that probably don't go together, but I like what I am wearing, and feel comfortable, so that is the main thing! PR: What is your current obsession style-wise? CHRYSTAL COPLAND: Creepers, Long flowy vintage dresses. red lipstick, Anna Sui's designs they are exactly the type of style I love, anything with sequins or sparkles! CHRYSTAL COPLAND: My Marc by Marc green bag with gold chain. CHRYSTAL COPLAND: Creepers or black heels. CHRYSTAL COPLAND: I am not really that into jeans, I never really have been. I think there is so many more other interesting things you can wear. PR: Best piece of advice you could pass on, regarding style? CHRYSTAL COPLAND: Dress in what makes you feel comfortable, don't copy a runway look and be original. PR: What’s the biggest mistake a model can do? CHRYSTAL COPLAND: Being late! best to avoid it.. I am working on not doing this haha. PR: Do you go to after parties during fashion week? CHRYSTAL COPLAND: I am not so much a party girl. I prefer to have a drink with friends at a chilled out bar, or at a friends house. Every now and then I enjoy parties, it all depends on my mood. PR: What's the best compliment you've received, for your work and for your look? CHRYSTAL COPLAND: For my work it would have to be my family being proud of me for the dedication and hard work I have put into my job. In terms of my look I would say people most compliment my eyes. PR: How do you stay in shape? CHRYSTAL COPLAND: I am a vegetarian and I love to swim and ice-skate. I also try to walk everywhere when I can. PR: What is your favorite brand of bottled water? PR: What is your favorite NY place to eat? CHRYSTAL COPLAND: I love Maoz! The vegetarian take away place in Times Square. I always order the Falafel salad bowl. It is so good. PR: What products do you use for maintaining your skin? CHRYSTAL COPLAND: I don't really wear sunscreen. I probably should be though. PR: Your choice of highlighter? PR: What is inside your make up ba? CHRYSTAL COPLAND: Concealer, Red Lipstick, assorted brown eyeshadows, mascara, white eyeliner. I normally just wear a bit of concealer and mascara. PR: What products at the moment do you use for your hair? CHRYSTAL COPLAND: Oil treatments are great, I need to take extra care of my hair ad the shows and shoots really start to take a toll on it after a while. PR: If one song could describe you, what would it be? PR: Tell us something we don't know about you? CHRYSTAL COPLAND: I want to write scripts and act eventually. I have been acting since I was young, and would love to continue with that at some stage soon. I am really focusing on modeling at the moment, but if I had the chance I would love to act also. I am always writing short stories, scripts and poetry, it keeps me sane with all of the traveling.